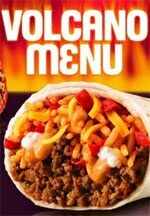 I'm a fan of the Volcano burritos at Taco Bell. The problem is, they aren't that filling and cost $3 a piece! So, one day I had an idea. Instead of ordering the volcano double beef burrito for $3, I ordered a Beefy 5-layer burrito (89 cents) and added volcano (lava) sauce, and crispy tortilla strips. To my surprise the total was only $1.59. If you can do without the tortilla strips it only comes out to $1.24. It's about the same size, has all the same ingredients, and even has the added bonus of nacho cheese that the volcano burrito does not have. I, too, am a fan of Taco Bell's Volcano Burrito. I have been since Taco Bell was nice enough to fly me out to their headquarters for a tour and the introduction of the Volcano menu. And I feel the same way... the Volcano Burrito is pricey and not very filling, so I had to try out this fast food savings trick. My version did not include the crunchy tortilla strips since that's never added much to the burrito for me... I just added the Lava Sauce and it ran me 30 cents. The Beefy 5-layer at my location was 99 cents, so the total for my 'version' of the Volcano Burrito came to $1.29. A savings of $1.70 from the $2.99 price of the Volcano Burrito.... less than half price! The 'Beefy 5-Layer with Lava' is a much heartier burrito than the plain old Volcano Burrito and it has the greatness that is the Lava Sauce. If you're a fan of Taco Bell's Lava Sauce and like saving money, I recommend you give this a try. I am CornFedHonky, and I approve of this message. I am the real CornFedHonky, and I approve of this message. the volcano burrito has twice as much beef, man. Order a Buck Double, and add mayo, lettuce, and tomato (mayo is free, L&T are $.15 each) and you'll get a double Whopper Jr. with cheese for the same price as a regular Whopper Jr. (w/o cheese) on the value menu (the WJ is $1.29 at my local BK).